......I'm not convinced that the "best" direction may not vary depending on these variables. I suspect Voyager is correct in that it probably doesn't make a ton of difference in most cases and I also would put the point of the Vee first on the front on a street tire.....OTOH I think Paul's diagnosis of the front D606's issues when mounted as recommended (open end of Vee facing forward) likely contributes to it's "less than confidence inspiring" performance on gravel. Tom correctly notes the different acceleration forces on the front vs. rear... Dual Purpose bikes like the KLR are used in such a wide variety of ways (which is the point of them) that determining what's best in any sort of blanket statement may be imprudent. JMHO, carry on. and since I run the omni-directional D606 rear and MT21 front, I guess it doesn't impact me much! 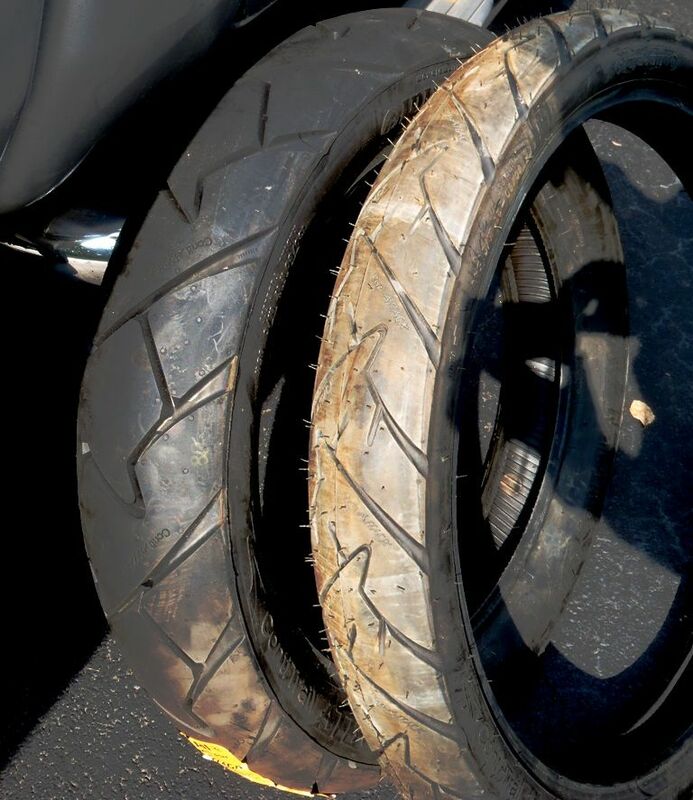 Motorcycle tires can and do hydroplane. Yes, the round profile raises the speed a little, but F=ma still holds. The harder you try to accelerate the water out of the way, the harder it resists. You've quoted an extreme case to make your point. 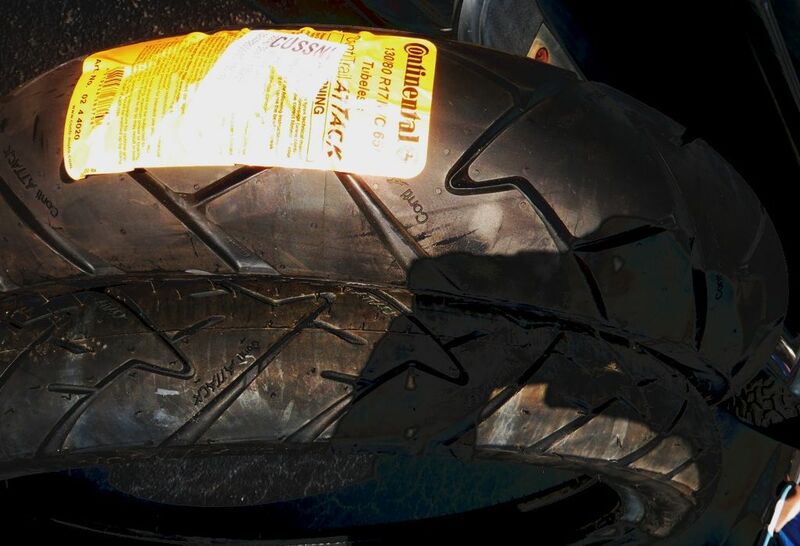 A very extreme case, apparently having missed "under any rideable condition". Would you ride headlong at 60mph onto a section of pavement covered in 6 inches of standing water? A brick won't survive that. Let's stick with the practical example of 60mph in a torrential downpour, a condition under which a car tire will hydroplane but a motorcycle tire won't. Citing f=ma to dispute an assertion in fluid mechanics doesn't work, either. My perception: Front and rear tire tread Vee orientations are reversed, if manufacturer's suggested direction-of-rotation is followed. YMMV! Last edited by Damocles; 08-27-2018 at 04:17 PM. Yes, and the imprint on the ground with the Conti Trail Attack front tire is Tops of the vee make contact 1st and the center Tip of vee contacts last. So the pattern acts like more of a wedge, instead of a scoop. Front Conti Trail Attack tire traveling to the right will leave this basic imprint on the ground >>>>>>>>>>>>>>>>>>>, to wedge the water, dirt, sand and gravel away from the center line. 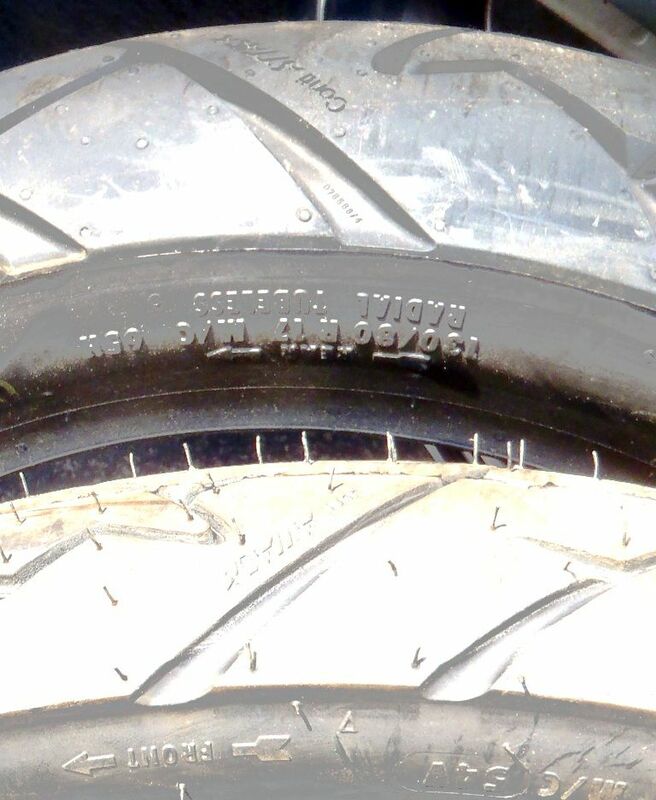 But the front Continental Trail Attack shown in the images above will never be, "traveling to the right," unless the motorcycle has a reverse gear or the tire is mounted, "backwards" from the maufacturer's direction. I tried to point out, the direction-of-rotation arrows in the images result in counter-clockwise rotation, rolling toward the left of the frame. Now . 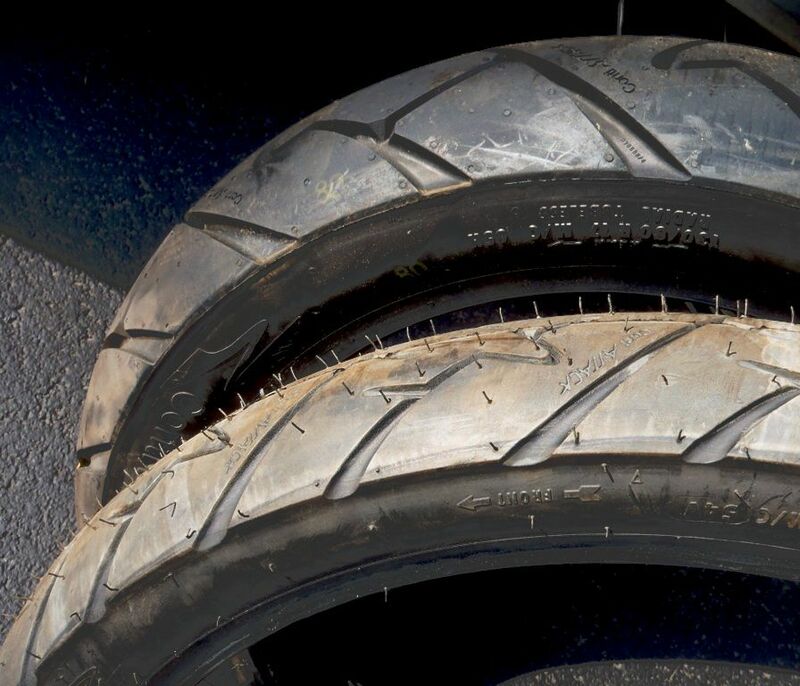 . . is the orientation of the Vees reversed, comparing front and rear tread patterns, if mounted in compliance with the direction-of-rotation arrows? Did Continental prescribe in error (a serious possibility, IMHO)? Considerations may be moot. Although designated a, "dual-sport" tire, the Trail Attacks may be somewhat pavement-biased, seems to me. Ok, so traveling to the left the Front Conti Attack imprint on the ground looks like this <. I'm out, We have confused the newer members enough. You made a fairly extreme assertion that motorcycles can’t hydroplane under any rideable condition. Not sure exactly what that is, but motorcycles can and do hydroplane under rideable conditions as I’ve had hit happen. It dodsn’t take 6 inches of water. 1” will do fine at 70 MPH on the interstate. F=ma is a fundamental concept in fluid mechanics. Even Wiki knows that. The tire is accelerating the mass of water on the road and the force from doing so is exactly what reacts against the tire. Accelerate the mass hard enough and the force from the water will lift the tire off the road and will do so in many “rideable” conditions. Although, I guess many riders are already to ride in the rain so I guess for some any rain might be defined as a non-rideable condition in which case your assertion then holds. But it is great fun!